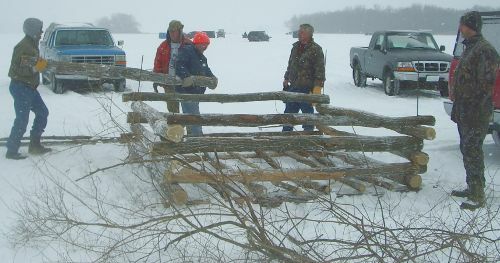 The BPCA is constructing and placing natural wood "fish cribs" in selected areas of Lake Onalaska. These structures are being placed in 15-20 foot water depths in an area that was previously dredged to form a "sediment trap" at the outlet of Halfway Creek. Woody bottom debris would typically occur in more mature bottom areas of a semi-riverine system like Lake Onalaska, and greatly increases the density and diversity of benthic invertebrates and fish. 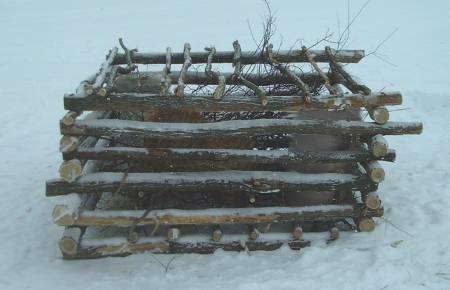 Undesirable (not native to the river bottoms) black locust trees were removed from nearby areas to construct the cribs.